I’ve been wearing a bunch of dark colors lately, so I thought I’d shake things up with something lighter! 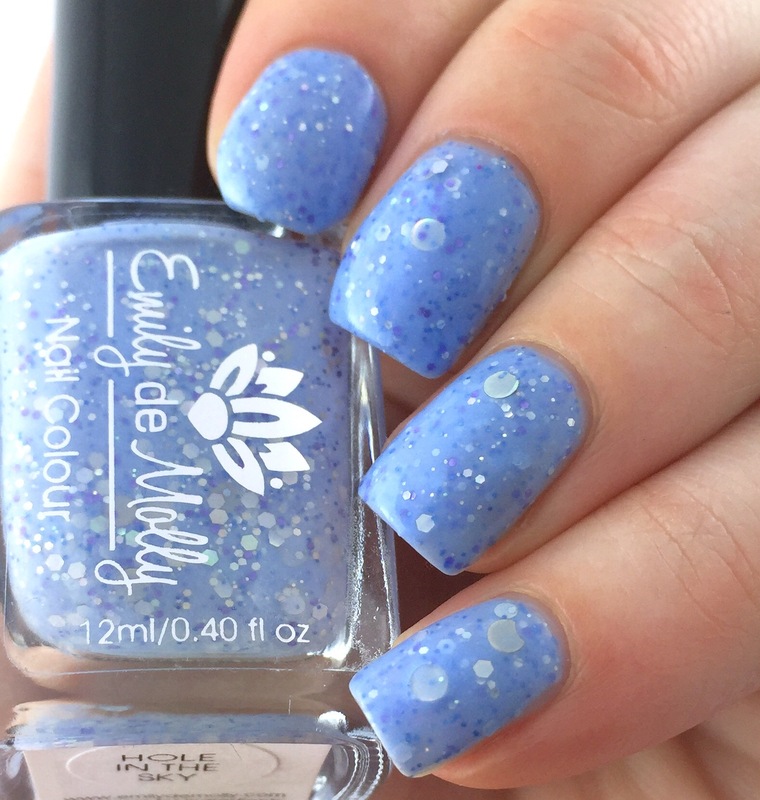 This pretty periwinkle crelly in Emily de Molly’s “Hole in the Sky.” There’s a robust (but delicate?) combination of different sized blue, violet, and silvery holo hex glitters, as well as medium-sized holo circle glitter. 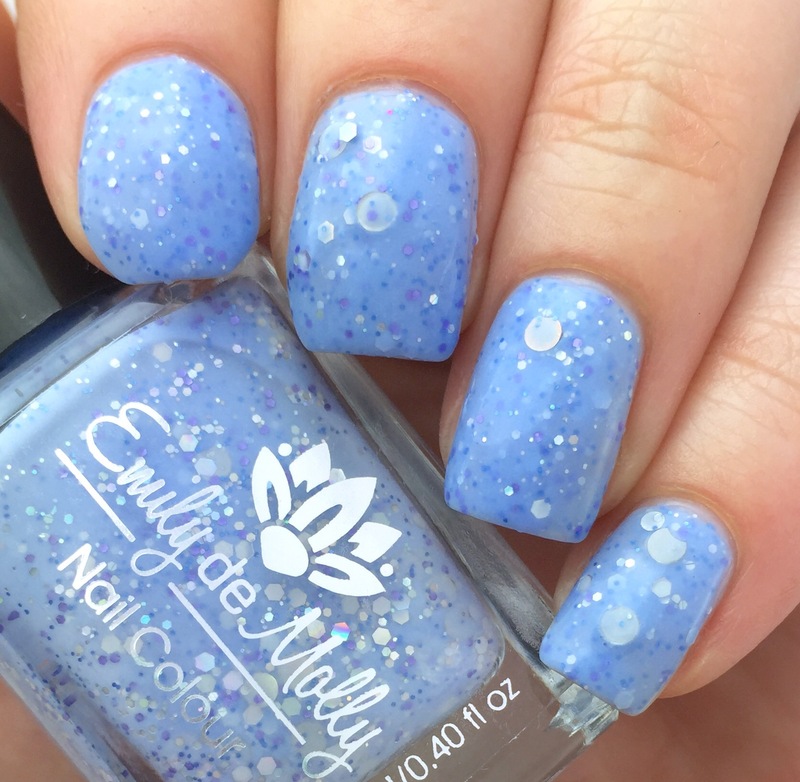 There is definitely a ton of glitter in this- it plays nicely enough with the crelly base that there’s no problem getting it out and on the nail, though. The circles take some finagling to get where you want them, but you do t have to fish them out of the bottle at all (the five you see on my nails in the picture all came out on the brush just fine by themselves). This is two thin coats with top coat. The formula is a little on the thick side, but I think that’s the glitter more than the base. This is only my third Emily de Molly polish, but I really like the brand’s glitter crellies so far. I really love the mix of glitter shapes and colors, plus I feel like the heavy load of glitter makes me feel like I’m getting my money’s worth. 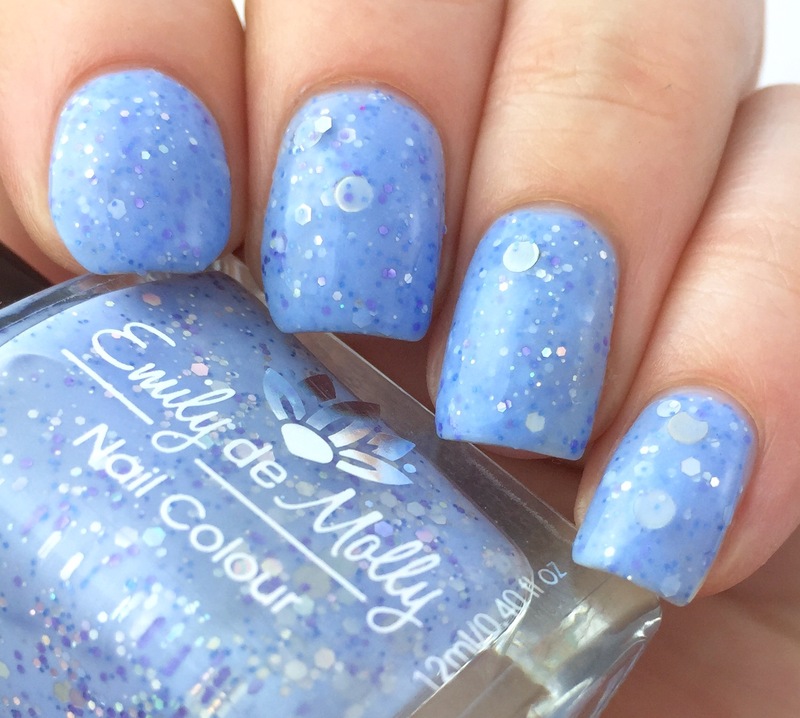 You can find Emily de Molly polishes on their website (there’s an Aussie version of the site and a US version) at highly reasonable prices. I’d also advise joining the Emily de Molly page or fan group on Facebook, since sales are announced there. This is so pretty and looks gorgeous on you. Beautiful, fun and delicate all at the same time. These are the types of blues that I love. This is a beautiful colour! I don’t think it would work on my skintone so I’m jealous it looks so good on you!